The Relief of Derry Symphony was composed as a contribution to the peace process in Ireland. It was commissioned by Derry City Council to commemorate the tercentenary of the famous siege of 1689 in a way that would help the reconciliation between the descendants of those who fought and died on both sides. For centuries, the siege of Derry - first in a series of Protestant victories - symbolised the estrangement of Protestant and Catholic communities in Northern Ireland. The battles of 1689-91 divided the Irish people into armies identified by religion - Catholics supporting Catholic James II, Protestants fighting for William of Orange. Conceived against this background, The Relief of Derry Symphony aims to assist in a process in which history becomes de-politicised and accepted as part of a common heritage. Its construction allowed for mutual participation by the Derry communities of both traditions, Catholic and Protestant. At the Symphony's premier in Derry's Guild Hall (1990) performers courageously crossed the political divide to take part. In the same spirit, church and representatives of both communities together attended a powerful, emotional performance which testified to a willingness to set aside the differences of the past. The first movement begins by portraying in musical terms the closing of the city gates by the Apprentice Boys of Derry continuing with the bombardment and siege in which 15,000 died. Trumpeters and a marching pipe band, performing both inside the hall and offstage, evoke for the audiences the sense of being inside a beleaguered city. The second movement is conceived as a prolonged battle sequence culminating in a thrilling meeting between orchestra and pipe band. Three soloists are introduced in the third movement which describes the suffering on both sides and the nightly vision of a white horse, symbol of hope. The air played by uilleann piper Liam O'Flynn and orchestra, followed by "A White Horse' sung by Rita Connolly, are perhaps the best examples of Davey's distinctive and personal development of the traditional lament styles. The fourth movement has as its centre a massive crescendo depicting the passage of the relief ships upriver and the end of the siege. The symphony concludes with an evocation of church bells followed by an air led by soprano saxophone soloist Gerard McChrystal. These express the city's sense of salvation and, at the same time, a present day hope for peace and goodwill. 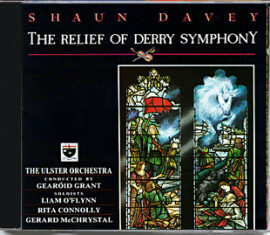 Following its premiere in Derry, The Relief of Derry Symphony was staged in the National Concert Hall, Dublin, in the presence of the Mayors of Dublin and Derry and 14 members of the Derry Council. The Performance was sponsored by Cooperation North whose mission it is to draw all the people of Ireland together through cross boarder initiatives.